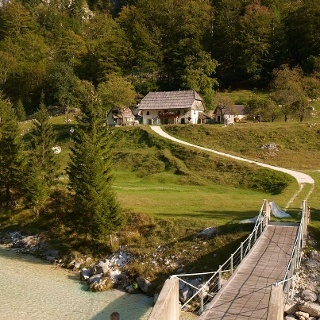 This route is a combination of the Via Dinarica White Trail, other existing hiking trails in Slovenia, my own hiking tracks and Outdooractive routeplanner. From the border with Italy to Predjama the route follows the Via Alpina red trail. From there on it's a combination of the newly Via Dinarica White trail and the Slovenski Planinarski Put to Gorenje. With the Slovenia 100Mile trail the route continues to Sveti Lovrenc, Planina and Rakov Škocjan. In Rakov Škocjan there is an education trail that leads you along the river Rak. Through the forest the water shows up again (or not) in the magical Cerkniško lake. During the summer the lake might dissapear completely. From Cerknica there is a well marked hiking path up to mount Slivnica, the home of the witches. Next mountain (hill) is Križna Gora next to Križna jama, a beautiful cave. This part of the route is part of the Cerknica Transversale. For stories about my hike, check out my blog EVAdinarica Project.